The term “five tool player” is as common in baseball conversation as double play and sacrifice fly. An actual five tool player, however, is a bit rarer. 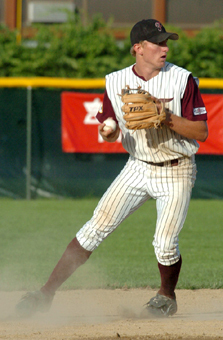 Falmouth shortstop Cliff Pennington (Texas A&M) is one of those rare cases. Pennington was a star in the batters box, in the infield and on the base paths in 2004, earning him the Manny Robello 10th Player Award. Pennington missed the first five games of the Cape League season, as he was still participating in the NCAA Super Regionals for Texas A&M. While he was away, the Commodores stumbled, going 0-5 to kick off the season. Not coincidentally, when Cliff Pennington arrived, wins arrived for the Commodores. Falmouth’s first win of the season came in Pennington’s first start, and it proved to be no fluke. Pennington led the Commodores to the West Division crown, their first playoff appearance since 1996. Pennington led the Aggies with a .339 batting average in the spring, and didn’t rest in the summer. He hit .277 for Falmouth, picking up three home runs and driving in 20 runs. Pennington stole 21 bases, five more than any other Cape League player. He tied the Falmouth mark for stolen bases held by Jon Kaplan (2002) and is only the second Commodore to lead the league in stolen bases joining former major leaguer Billy Almon who paced the circuit with 15 in 1973. While he excelled at the plate, Pennington’s biggest influence might have come with the glove. The shortstop was a walking highlight reel all summer, routinely making diving stops in the hole or up the middle, then showing off his outstanding right arm and throwing out would-be base runners. In the third inning of game three of the West Division Championship Series, Pennington recorded his second base hit of the evening, but hit first base awkwardly and injured his ankle. He had to be replaced and would not participate for the remainder of the playoffs. He is the second Commodore to win the award joining 1992 honoree Steve Hirschman (Michigan State). Justin Maxwell (Maryland) won the 10th Player Award in 2003. He was drafted in June by the Texas Rangers.